conditions (184). Multiple entry and exit points are observed when current paths are established through multiple arcs (Fig. 32; refs. 147, 152, and 207). Exposure to water causes decreased skin resistance and an increased contact area, which reduces current density. The result is no visible skin injury; however, a low-voltage source is still lethal (e.g., moistened skin having a resistance of 1000 Q exposed to a 110-V source results in a current of about 0.1 A or 100 mA, the threshold for ventricular fibrillation [138,139,141,145,147,152,208]). Electric burns in bathtubs are possible, if part of the body is grounded to a metal fixture and out of water (188). Unusual water-related electrocutions have been described (e.g., drinking from a water fountain in contact with an electric current from an underground cable; urinating on an electrified rail line ). Severe burns are more likely with high-voltage contact (141). High-voltage direct contact is associated with deep soft tissue burns and even thermal injury of bone (38). 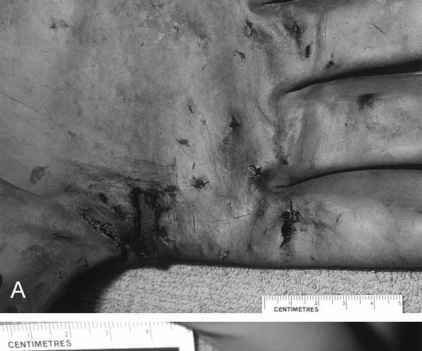 High-voltage victims often have a black metallic coating on the skin surface owing to vaporization of metal contacts (147). Skin burns are sometimes patterned matching the electrical source or an area of the body covered by metal jewelry (161,210). Entry and exit burns range from pinpoint to large and can be missed (Figs. 31 and 32; refs. 38, 147, and 158). Exit wounds are not necessarily larger than entry wounds (147). They have a central area of charring surrounded by a gray-white zone of necrosis (140,158). A more peripheral red zone can be seen (140,158,161). Surrounding erythema is not necessarily a vital reaction (see Subheading 3.3. and ref. 163). Assuming a temperature of at least 90°C (194°F) produces charring, about 30 s of skin contact with a low-voltage electrical source is needed before this occurs (163). 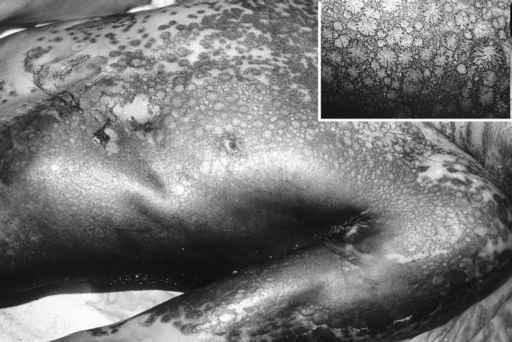 A temperature of about 54°C (130°F) for 40 s causes epidermal necrosis (211). Fatal arrhythmia has occurred by the time cutaneous burning is seen, which means that the skin features of electrical burns are likely postmortem (139,163). An AC stimulus lasting from 1 to 10 ms causes ventricular fibrillation, whereas the development of a first-degree or erythematous burn requires 20 s of exposure to a current of more than 20 mA/mm2 (139,163). In contrast, AC (115 V) applied to a dead pig's skin showed no peripheral hyperemia around the burn site. This was observed only antemortem (212). Contact is not necessary to cause an electrical burn (38,147,157,207). Arcing is associated with higher voltage (>300 V) electrocution, including lightning (139,140, 147). The forearm of a victim near a 7500 kV power line can draw an arc when 3 to 4 mm away (147). Arcing is possible with larger distances of separation when the fingers are outstretched or pointed objects (e.g., screwdriver) are being held (147,207,209). Electric arc temperatures approach 2500°C to 5000°C (4500°F to 9000°F), causing severe burns (139,141,145,149,150,152,157,161,209). Clothing, particularly shoes and socks, can show arc marks (139-141,149,150,157,161,163,209). Arc burns also extend deep into soft tissue and even bone; however, they can be subtle and missed on external examination (139,141,158,207,209,210). "Kissing" burns occur when electrical current arcs across flexor creases (elbow, axilla, wrist; see refs. 144, 145, 147, 152, 158, and 210). Contacts and exits can be difficult to distinguish because arcing is possible at entry and exit points (Figs. 31 and 32; refs. 38 and 151). A victim can be indirectly exposed to the intense heat of electrical current arcing to the ground (139,158). Lightning injuries can be the result of direct strike, contact, side flash ("splash"), ground current (step voltage), and blunt trauma (see Table 3 and refs. 141, 142,147,176, and 213). • Associated cerebral infarction and ground current tend to spare the head (166). 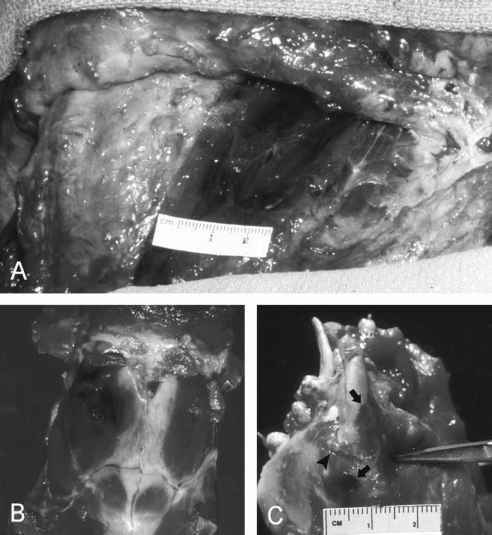 Blunt injury results from opisthotonic muscle contraction, from the blast created by the explosive force of air superheated by lightning and then rapidly cooling, and from falls (147,152,167,174). Fig. 34. Electrocution (contact with high-voltage line). 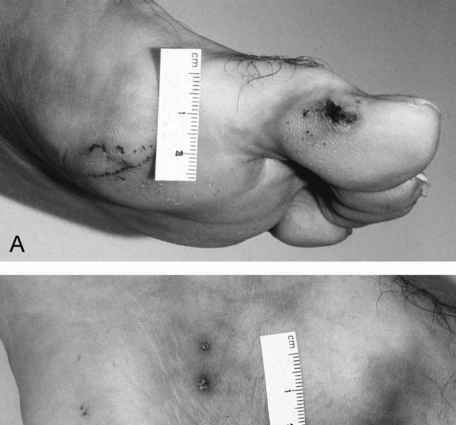 Cutaneous burns owing to flashover (inset shows "crocodile skin"). series, 90% of lightning victims suffered burns (two-thirds had burns on the trunk, half had burns on the head), but only 5% had deep burns (143,153,164,167,174). There is limited internal current flow with a lightning strike, and thermal effects, except for at the site of contact, do not play a major role in organ damage (139,141,142,147,150,174,180,229). Lichtenberg figures (fern-like figures) describe a physical phenomenon of arborescent red areas on the skin that appear within 1 h of a lightning strike, and usually disappear after 24 to 48 h (Fig. 35; refs. 38, 180, 205, 213, and 216). Lichtenberg figures are not burns. They do not correspond to vessel or nerve distribution. They are related to positive charge caused by a secondary positive flashover from a nearby object in relation to a person hit by negatively charged lightning bolt. 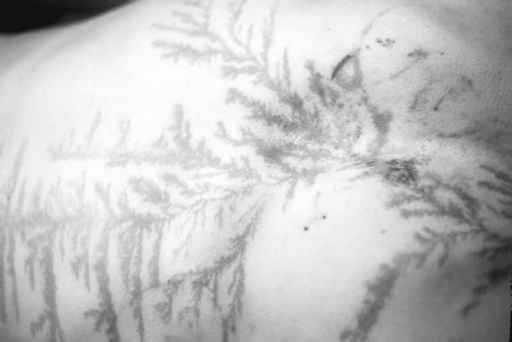 The Lichtenberg figure is consistent with fractal behavior, in which a positive discharge attracts electrons from the surrounding skin. (A fractal is a mathematical object that manifests increasing detail with increasing magnification, such that the smaller magnified structure is identical to the larger one [38,213,216]). Does high electric voltage tear skin?